NordicBet makes it hard for their not so frequent players to play! I regularly play online but I try to test many different igaming portals and sometimes it takes a while before I return to a portal. This was the case when I today returned to NordicBet’s portal. I usually use a couple of different usernames but none of them worked when I tried to log in. So I thought that I could find out my username by requesting a new password. But it didn’t work. I only got an e-mail with a new password. So my only option was to contact their support, and this is something I very seldom do. And I didn’t do it this time either. Below you see the login and request a new password dialogue. Image 1. NordicBet’s login dialogue. Image 2. I tried to login but didn’t remember my details. Image 3. 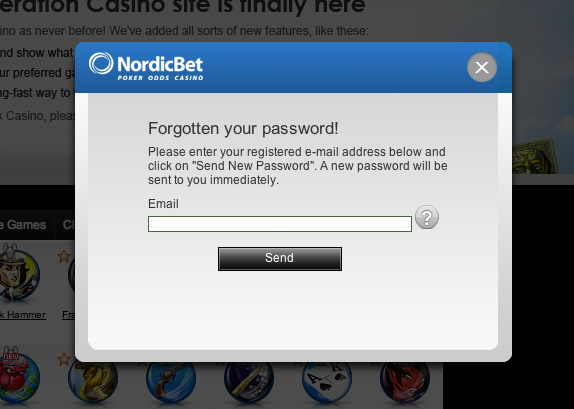 You can request a new password from NordicBet. I was a lost player for NordicBet today. Maybe I’ll come back another time and contact their support. It would be much better if it was possible to login with my e-mail address as well as my username, that way I could be playing as soon as I got my password by the mail.